Discovering 2014 is a personal goal to complete a daily project every day throughout the year! 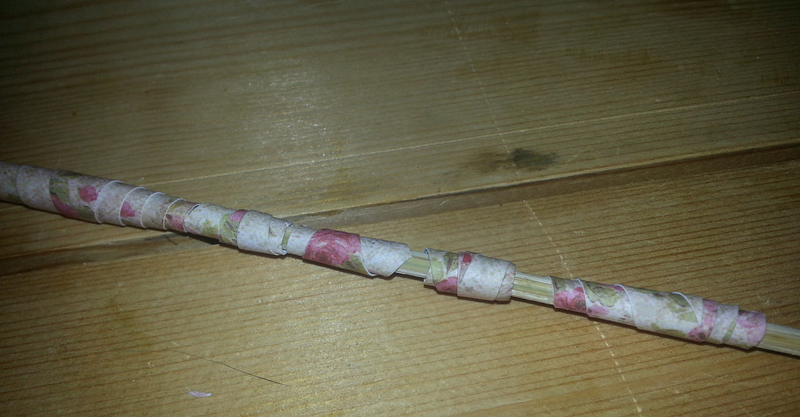 My day two project is Paper Beads. I have a confession with this one: I actually started it yesterday, since it’s time consuming, I had a day off work, and I wanted to have time to make a final product with them today. 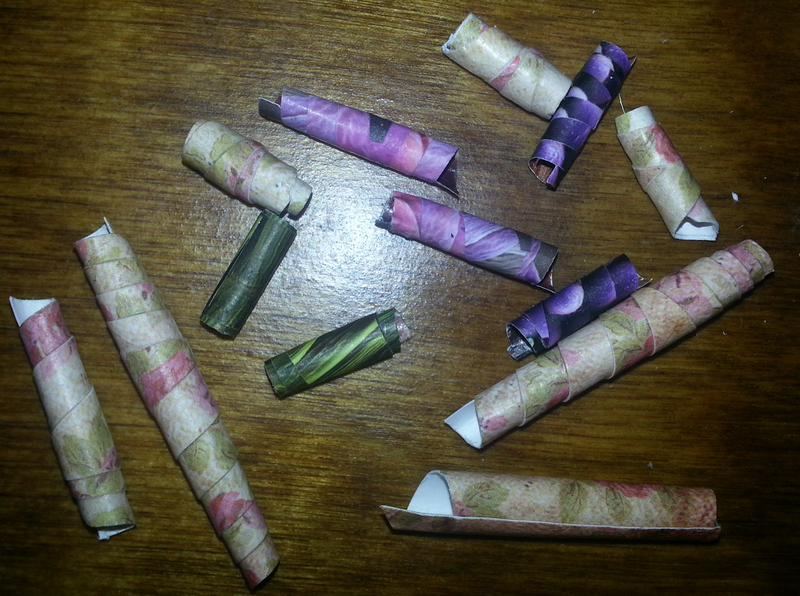 Paper Beads are something I’ve seen from time to time on Pinterest. I’ve repinned this pin showing various techniques, this pin showing how to make them using a calendar, and this pin for making round scrapbook paper ones with Mod Podge Dimensional Magic. The round ones are different than what I did here and I may try those in a future project since in the end they look more interesting to me. While these were fun to make, mine obviously look like rolled paper, compared to pictures I’ve seen that look like normal beads and not paper at all. I can definitely see doing it again in the future if I have a very specific project that requires a highly custom look, but overall I don’t think the time investment paid off for me. Here’s the process I took! 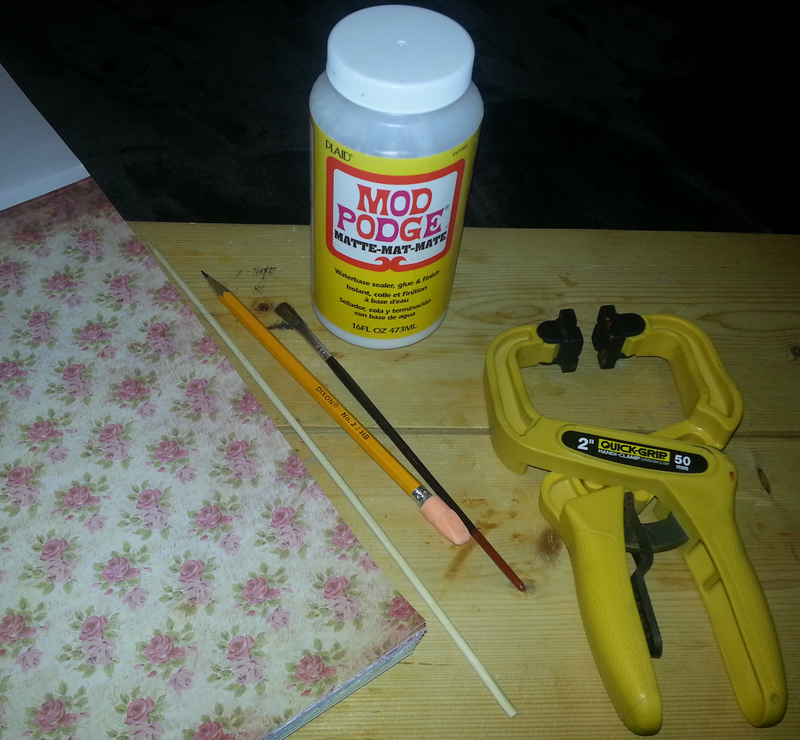 I started out by choosing a piece of extra scrapbook paper, a skewer, a paint brush (which I later changed up for a foam brush after recalling that Mod Podge kills paint brush bristles) and a clamp to hold the skewer. Not pictured are a measuring tape and scissors. Google landed me on the wikihow page, so I used that for a guideline. 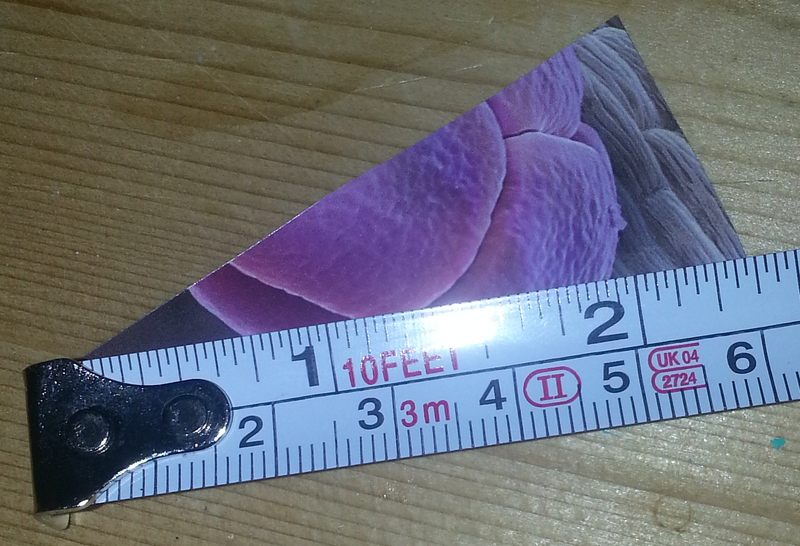 The first ones I cut were about 4.5″ long and varying widths. In the long run making a long yet narrow triangle probably would have been best. The first bead I rolled (on the right) proved I didn’t really read the instructions beyond “roll” and “glue”, because I did narrow to wide. Oops. The second (left, covered in Mod Podge) turned out better, but I was surprised at how long they were. 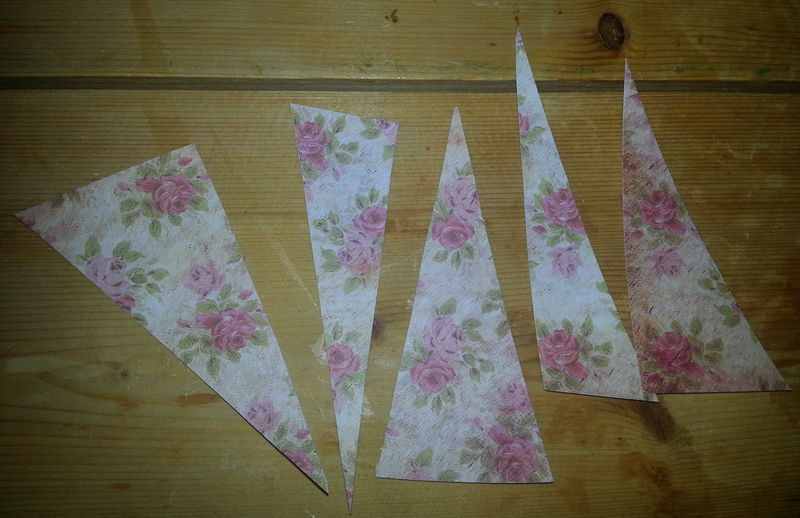 I ended up hacking some of my triangles shorter and came up with a variety of widths. Next I figured I’d try a magazine. I had a National Geographic issue from December 2009 that had long outlived its usefulness, so I hacked up some triangles from that. I tried to keep the magazine triangles shorter, around 2.5″ long. I covered the rolled beads in Mod Podge and left them to dry overnight. After about 10-15 minutes I was able to take them out of the clamp and had them propped up inside a storage bin. 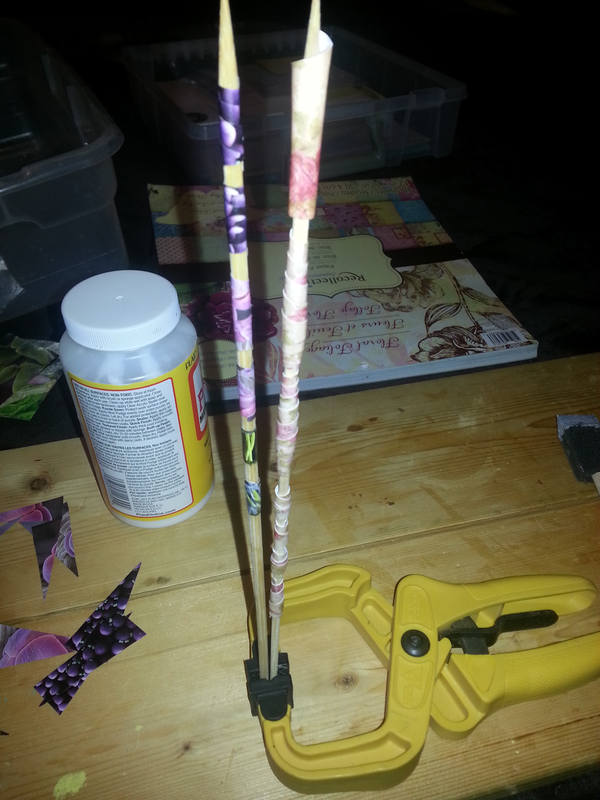 I also checked by gently trying to slide and/or turn each one to ensure I didn’t glue it onto the skewer. 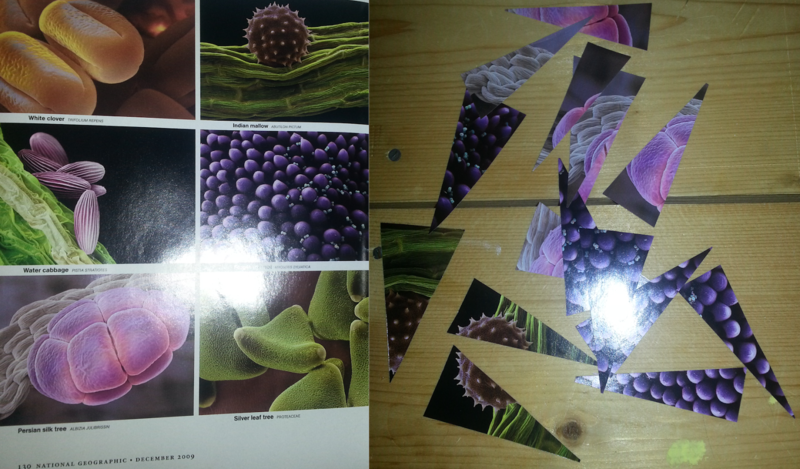 While gluing on the ends of the scrapbook paper and the magazine paper, I definitely noticed a difference. The scrapbook paper made a quick bond, whereas the magazine paper I had to hold about about 20-30 seconds before it began to make a bond (likely due to the glossy surface). This afternoon I took the beads off of their dowels. Only one gave me problems sliding off and it still came out in one piece. They make an interesting clattering noise if you drop them on the desk! 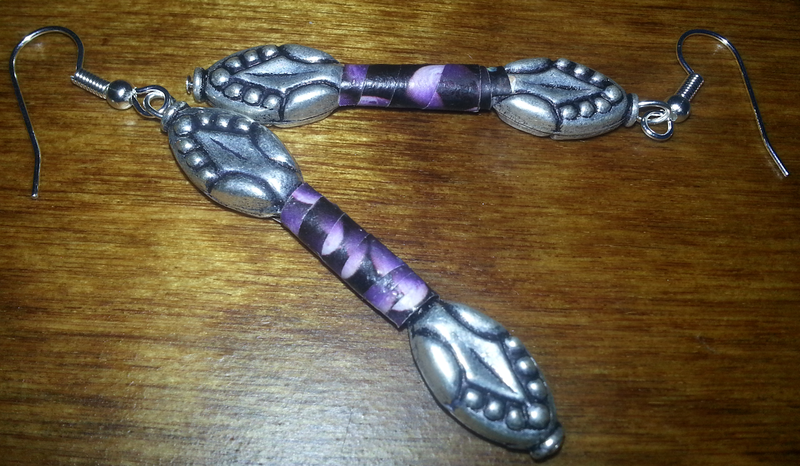 On the left is the first bead I rolled the wrong way and on the right is the second one rolled the correct way. the difference is pretty obvious! Since I had messed up that first one anyway, I decided to see what happened if I trimmed the ends to be even. It didn’t horribly mar it but there is definitely a touch of obvious damage to it. Finally, here’s the earrings I made a little bit ago. It was difficult finding beads I have that actually worked well with the paper beads. They look nice and it’s unique, but these won’t be something I’ll dive into making a massive amount of. Tomorrow’s project is Paper Bows. If you haven’t yet, remember to follow the Aira Artistry page on Facebook!